Griffiths House is an accommodation building built on the site of HMAS Creswell in Jervis Bay, established in 1915 as the location for the Royal Australian Naval College. 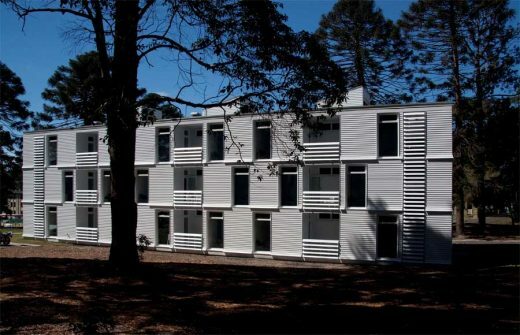 It provides short term accommodation for Officers of the RAN who are at HMAS Creswell to undertake leadership and management training, and consists of 32 single bed units with shared ensuite and deck facilities. HMAS Creswell has major national heritage significance and is located on the Commonwealth Heritage List which is a register of the National Estate and is classified by the National Trust of NSW. The site is characterised by white washed weatherboard buildings set out either in a formal manner around manicured lawns and gardens (the training precincts) or in a more organic fashion following natural contours and surrounded by native bushland (the accommodation precincts and married quarters). The new building sits in an ambiguous zone, alongside buildings inappropriate to their location and climate (1970’s 3 storey face brick accommodation blocks), yet not sitting amongst the original graceful timber and terracotta tiled building stock of Creswell. As such this new building has determined its own built language, in an economic and robust manner whilst being sympathetic to its environment. It utilises the weatherboard cladding and vertical proportioned windows of the original building stock and picks up the gentle curved timber ‘bell’ detail typical in the decorative verandah elements of the original buildings, yet expresses the floor structure within a grid like pattern to reduce the scale of the three level elevations. Griffiths House a new residential building at the Royal Naval College, HMAS Creswell on the shores of Jervis Bay won a Multiple Housing Award for its architects BVN Architecture at the Australian Institute of Architects, ACT Awards held on 4 June 2011. The site is of great environmental interest with strong heritage links for the Navy. It is on the Register of the National Estate as a site of heritage significance and is also on the Commonwealth Heritage List. Griffiths House seeks to re-establish a connection with the earlier, original, white weatherboard clad cottages and larger public buildings characteristic of the Naval site. This is the latest architecture award BVN has received in recent years for Defence projects, including the Robin Boyd Award for Lavarack Barracks, the Sulman Award for RAAF Richmond and the Interior Design Public Buildings Award for Puckapunyal Chapel. This makes BVN the only architecture studio that is consistently receiving notable architecture and design prizes for Defence projects. ‘It is possible to reach a high level of design excellence whilst still meeting the Defence requirements of robust, cost effective buildings,’ said Ms Abbie Galvin, BVN Principal responsible for the Griffith House design. ‘These facilities are the workplaces and training grounds for the current and next generation of Defence personnel and it is important that they incorporate innovative and advanced thinking to support these functions,’ she said. Griffiths House now becomes eligible for a National Architecture award that will be announced by the Australian Institute of Architects in late October.